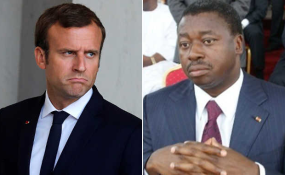 President Emmanuel Macron and President of Togo Faure Gnassingbé . The UN chief is in the Ethiopian capital to attend the annual African Union summit, which brings together Heads of State from across the continent. This year's event, which begins on Sunday, will focus on the issue of refugees and internally displaced persons. Mr. Guterres, who spent 10 years as the UN's High Commissioner for Refugees, before taking up his position at the head of the organization, said that, in Africa, borders are open for refugees, and that the continent is in the leadership when it comes to addressing migration flows. The UN chief pointed out that, contrary to popular perception, there are more African migrants in other African countries than in Europe, and migration has been dealt with in a much more humane way. Mr. Guterres appealed for the UN's global compacts on Migration and Refugees to be fully implemented. The UN Refugee Agency UNHCR says that Sub-Saharan Africa hosts more than 26 per cent of the world's refugee population. 18 million people in the region are of concern to UNHCR, with conflicts and ongoing crises in the Central African Republic (CAR), Nigeria and South Sudan, as well as Burundi and Yemen, driving large increases in the numbers of refugees and displaced people. On the eve of the summit, the UN Childrens' Fund, UNICEF, published a press release warning that 13.5 million children have been uprooted in Africa - including those displaced by conflict, poverty and climate change - and called on African leaders to implement policies and programmes to protect, empower and invest in refugee, migrant and displaced children. Mr. Guterres struck a generally positive note in the press conference, pointing to recent peace deals and conflict de-escalation across Africa. He cited the reconciliation between Ethiopia and Eritrea; the establishment of peace agreements in South Sudan; and elections in Madagascar, the Democratic Republic of Congo, and Mali, that took place in a peaceful context. The combined efforts of the African Union and the UN, he said, are producing results in conflict resolution and the prevention of conflicts, and Africa is seeing a "wind of hope" that can be extended to other parts of the world. However, he went to say that there cannot be peace without development, and that the international community must show more political will in this area, particularly in climate action, and show ambition for mitigation, adaptation, and finance: "We are losing the race with climate change and this can be a disaster for Africa and for world. Africa will pay an even higher price because of the dramatic impacts in the continent."